I’m now through with the second book that I recently bought in order to learn more about digital methods for creating good black-and-white photographs. 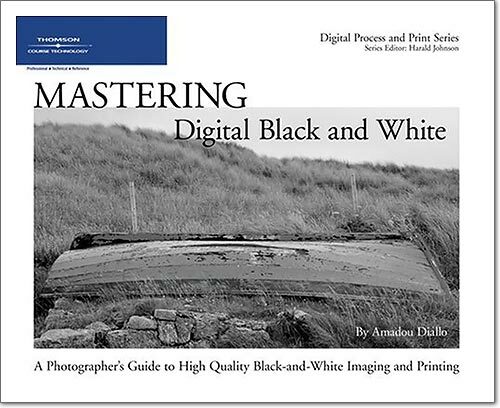 The review of the first one can be found here and today I will talk about Mastering Digital Black and White / A Photographer’s Guide to High Quality Black-and-White Imaging and Printing by Amadou Diallo. Let me start off by saying that this is a good book. But, and this is a big “but,” the book has little to do with black-and-white photography. Whereas the book by John Beardsworth spent more than half of its pages teaching me general things about image composition, the book by Amadou Diallo spends about 80% of its pages on technical things like tuning Photoshop, calibrating my monitor, etc. Don’t get me wrong, these are all extremely important things that everyone should know, but they simply don’t belong in a book about black and white photography! No one in this day and age starts out immediately with black-and-white photography. We all learn photography, composition and basic Photoshop editing in color. At some point we want to experiment with black-and-white, and we do not need all this stuff repeated in a text about black-and-white! But enough ranting! Who is this book for? It’s definitely for the technically oriented photographer, someone who does not care or already has mastered the creative and artistic part of photography and who is looking to understand the ins and outs of the digital process. If you are just starting with digital, you should probably look somewhere else for help. If you’ve already read a bit about JPG vs. RAW, color spaces and profiles, linearization of your ink-jet printer and so on, then this book will be on your level, but I think that there are better texts out there, (different texts for different topics) that treat each topic with the necessary depth and breath. What Amadou Dialo has done is survey these topics and illustrate them with CS3 dialogs. The book starts out with a black-and-white gallery of about 30 images, which I found good, but not as inspiring as images by others. The print quality of the images in this book is average at best. The next 40 pages are a survey of modern computer equipment that has pertinence to digital imaging. They cover CRT vs. LCD, DVI vs. analog, Mac vs PC, CPU, memory, hard-drives, video cards, configuring Photoshop, external storage, scanners, ink-jets, paper types, spectrometers and test images and charts. The section on printers lists current prices, size, weight and paper-handling capabilities. Do you now see what I mean? It tells you what you should think about, but it does not go into enough detail to teach you something. And what does this all have to do with black-and-white photography?!?! Now come 33 pages of good discussion about calibration and Photoshop settings and 40 pages about the histogram, RAW converter, basic RAW editing and film scanning. Everyone working digitally should know this stuff! Then come 52 pages of “Photoshop in Black and White” — a section that introduces Photoshop, its tools, palettes, levels (forget about levels!!! ), curves, 16 pages on blending modes, exactly 3 pages on color-to-black-and-white conversion (wow, in a book about mastering black-and-white!!! ), one page on sharpening and one page on soft-proofing. Hmmm, I would have expected that this section fills the entire book! The book continues with 40 pages about “Black-and-White Ink-Jet Printing”: color vs. monochrome setting in the printer driver, economics of ownership, roll vs. sheet paper, printer profiling, inks, output sharpening (good! ), and Photoshop’s printer settings. Next are 27 pages about the imaging workflow. This is interesting, but teaches hardly anything new. The book finishes with 32 pages about limited-edition prints (including law regulations, but probably applies only to USA) and 28 pages about assembling and presenting a portfolio. So, should you read this book? I’m hesitating here, but it’s a good technical book, so I’d say yes, but because of its survey nature of the state of digital photography in 2007 and not because of its black-and-white content.